Taken literally, your article pours violent scorn upon my religion. Unfortunately, today the uneducated are sparked by this type of coverage to commit acts of violence on innocents. 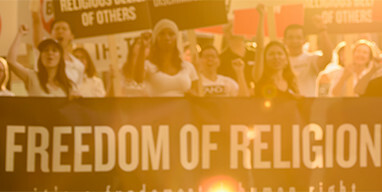 While I think I understood your point—for Gawd’s sake, if you are going to protest perceived discriminations, at least do so to ones that truly mean something—and agree with you; your use of the Scientology religion for your “metaphor” is truly horrible and could easily be misread or misconstrued by the casual reader. Why not say, “If only ISIS were Catholicism” or “If only ISIS were Islamic” or perhaps “If only ISIS were the American Spectator.” Why not just paint with that brush any organization, religious or not, and compare them to a name associated with societal evil? Answer: It would be outrageous and offensive to do so. Here’s what I believe you miss. Taken literally, your article pours violent scorn upon my religion. Unfortunately, today the uneducated are sparked by this type of coverage to commit acts of violence on innocents. I respect your publication’s right to freedom of speech. However, gratuitous, inflammatory and false comments do nothing other than show a disdain toward people of faith.